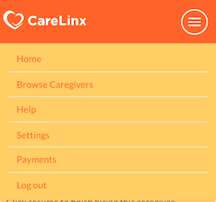 Once you have created your job post, your first step to finding a great caregiver is to begin browsing through the caregivers on CareLinx. Follow these easy steps to begin browsing. 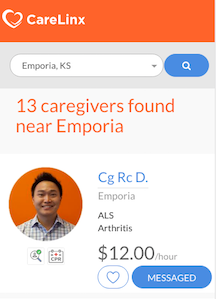 Type in the city where you're looking for a caregiver. Caregivers nearby will come up. 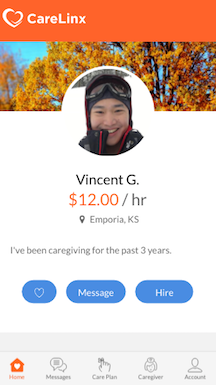 You can click on any caregiver in order to view their profile. If you are interested in any caregiver you can message them. 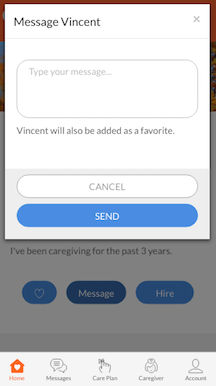 If you click 'MESSAGE' you will see a popup where you can write your message to the caregiver. Once you write your message, click 'SEND'. Tip 💡: Phone interviews are the best way to gage whether or not this caregiver may be a good fit. Set them up with various caregivers and then decide you would like to interview in person.